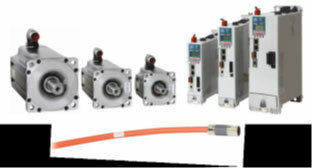 Contel is the official provider of Rockwell Automation (Allen-Bradley) Servo Motors, Linear Motors and Electric Cylinders to the industry and provides services of designing, planning and installing motion applications at the customer location. With a team of professional engineers who are responsible for application design, mechanical design and engineering, Contel is providing high quality solutions for motion application with Rockwell Automation (Allen-Bradley) products. A wide range of available features and technologies from AC drives & Kinetix family of servo drives allow you to find the best choice for your machine. LDC-Series™ Linear Servo Motors (Bulletin LDC) provide precise linear positioning at very high speeds. Direct Drive linear motors are connected directly to the payload that needs to be moved. This direct connection provides excellent servo responsiveness, resulting in faster settling time for a move. The LDC-Series has an iron core design with high force density. Bulletin MPAR MP-Series™ and TLAR TL-Series™ Electric Cylinders provide a dynamic, precise response for a wide range of linear motion applications. These cylinders use RSLogix™ 5000 software (version 20 or earlier) to extend and retract with precise positioning, velocity or force. Industry-standard mountings and end effector attachments help simplify your assembly and reduce mechanical design engineering, wiring, and commissioning time. High quality and stand up to exceptional conditions such as the extreme thermal and electrical demands of low-speed high-torque applications. general-purpose and vector motors with NEMA Premium Efficient designs and optimum variable speed performance and service life. We also have durable motors for use in harsh environments. Servo Motors include a broad portfolio of Rotary Motors and Linear Motors. Rotary motors comprise several series including the VP Low-inertia motors, the MP-Series™ of stainless steel, food grade, medium-inertia and low-inertia options, and the HPK-Series™ High-Power motors. Linear motors include the LDC-Series™ and LDL-Series™ with no-wear.